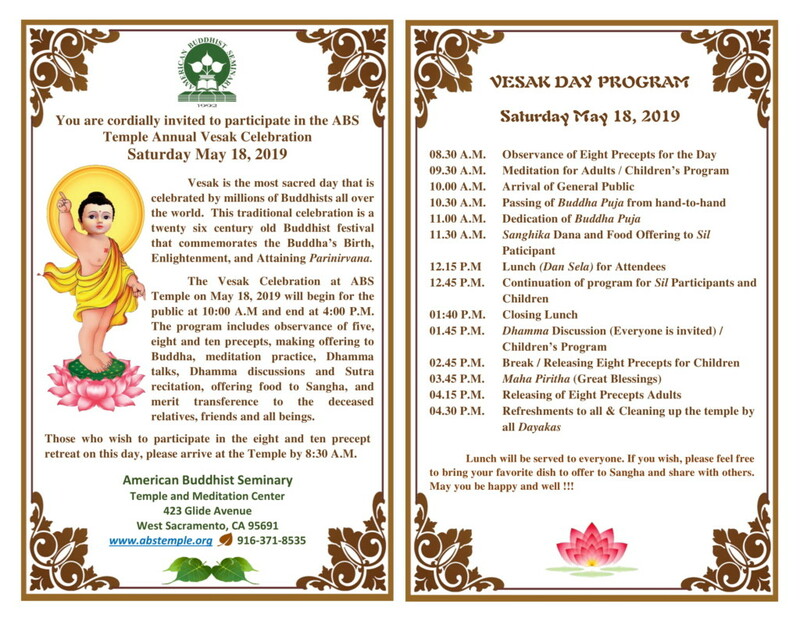 It is with great pleasure that we, the monks and the Dayaka Sabha of ABS Temple, invite you to join us to celebrate our annual Vesak Festival on Saturday May 18, 2019. This is the traditional celebration of the Birth, Enlightenment and Passing Away of the Buddha that falls on Full-Moon day in the month of May. SIL (Precepts) Retreat – May 18th Starts at 8:30 A.M.
On May 18th we will have a SIL Retreat at the ABS Temple starting at 8:30 A.M. and ending at 4:00 P.M. Adults and children are invited to participate in the program to observe eight precepts for this day of learning and practicing Dhamma. Those who do not participate in the SIL Retreat please arrive at the temple by 10:00 A.M. to participate in Buddha Puja and Dana to monks and the SIL participants. Please bring your favorite dish for offering and to share with others, as in the past years (rice will be prepared at the temple). 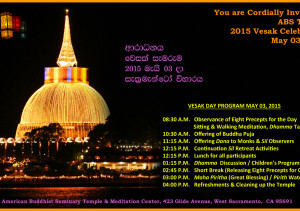 Afternoon program includes Dhamma Talk, Dhamma Discussion and Children’s program. Another special event of the day will be the Maha Piritha (Great Blessing) recited following the style of Six Month Blessing Ceremony that starts at 3:00 P.M. Please plan to join this ceremony to receive blessings for good health, success and happiness for yourself and your family. All activities of the day will end at 4:00 P.M.
We look forward to seeing you, your family and friends at this annual special event. May the blessings of the Triple Gem shower blessings upon you for your good health and peace of mind. Previous Article ABS is cordially inviting you to attend 2019 Kathina Ceremony in October on Saturday the 26th and Sunday the 27th at the ABS Temple at 423 Glide Avenue, West Sacramento. Thank you! Next Article ABS is grateful to all of you for participating in the Ground Breaking Ceremony in November 2018. We are now close to beginning the first phase of the building project. This will include the complete grading of the total property and demolition of the current Buddha Hall, carport, and other structures. We appreciate your continued financial support so that we can proceed with these costly stages of the project! American Buddhist Seminary (ABS) is a non-profit religious, educational and charitable organization registered in California with Federal Tax Exemption under section 501 (c) (3), 509 (a) (1) and 170 (b) (1) (A) (i) of the Internal Revenue Code.